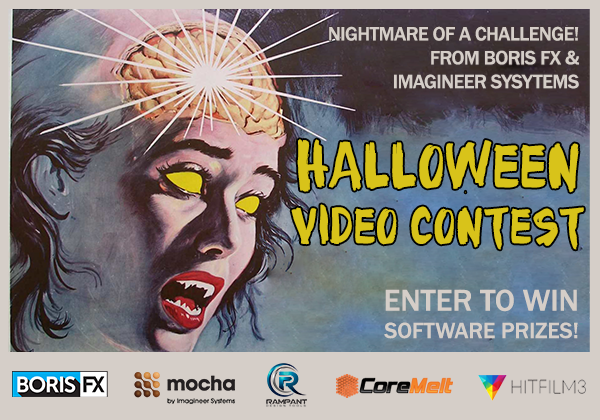 Boris and Imagineer Systems have teamed up with a bunch of other awesome VFX plugin manufacturers to bring you an annual ghoulfest contest! - And prizes from Rampant Design! - Submit a short “scary, spooky, Halloween inspired” video (no longer than 5 minutes). - All videos must use mocha AE or mocha Pro or Boris Continuum Complete for some aspect of the post-production/vfx. - Contest ends: October 30th at the strike of midnight PST! - Create an interesting or scary or humorous “Halloween” inspired short video that uses any of mocha AE or mocha Pro’s features including: Planar Tracking, Rotoscoping, Screen Inserts, 3D Camera Solve or Object Removal; or Continuum Complete’s features including: titling, 3D objects, particles, lights, and more. - Upload your finished video to Vimeo or YouTube (Vimeo preferred). - When your video is ready to be viewed email them with the link, your full name and email address. - All content must be yours. Only original materials will be considered. - You may enter more than once. - You may submit older projects for consideration, but preference will be given to fresher material. - Have fun! This is an opportunity to learn something new and promote your work. Here's a Halloween inspired tutorial using mocha in After Effects, as well as some of last years entries.